Content marketing is one of the most effective and most commonly used marketing methods for businesses of all shapes and sizes. Still, it needs to be done properly in order to get adequate results, and this is not an easy thing to achieve. This is why the most experienced marketers know a lot of secrets and techniques to come up with quality content. Given the fact that most of us don’t possess all the knowledge that they do, we need to find alternative ways to create engaging content. One of the best ways is to use a tool called Google Trends, which allows you to discover topics that are trending at any given time. You simply do this by tracking how many searches there are on a certain topic. But this is just the beginning, there are many other ways that you can use Google Trends to create better content. Today we will mention 5 ways that we found most useful. One of the biggest difficulties is to come up with fresh topics for your content that will engage your target audience. With Google Trends, you can give the data context and meaning by using visual charts to present them and compare similar terms, see information by interest in a region or highlight queries that are related. Finding relevant topics to write about can help you get more traffic through your content. Simply go to the dashboard and find stores that are currently trending. Use the filters to find the right category that is interesting and relevant to your target audience. This feature helps discover topics that people are interested in, and this can help you in determining what you need to write or find new topics which are related to ones that people are currently interested in. Google Correlate allows you to find associations between different search trends or any data point you are interested in writing about. This is the only tool that can perform such actions using search data, but a lot of people don’t even know about it. 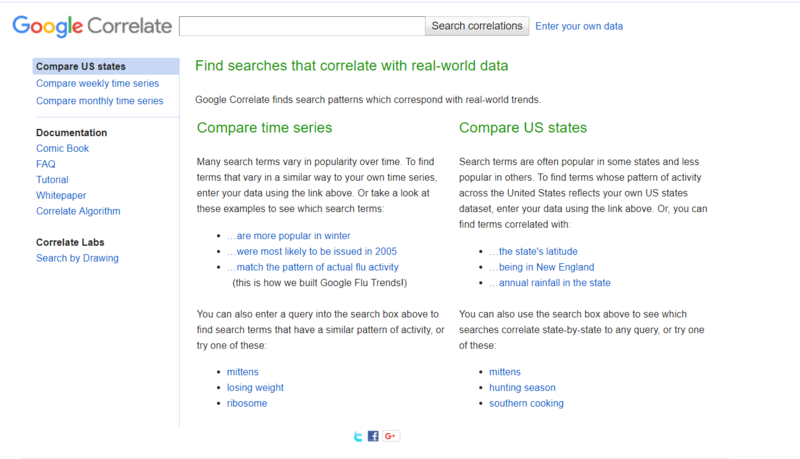 You simply enter a term into Google Correlate and you will get other search terms that are associated with that one. 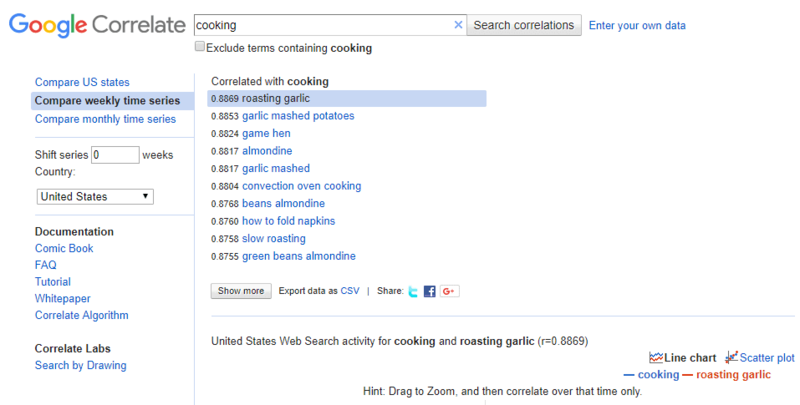 For example, if you type in “cooking” you will get these results. With these new terms, you can get various new content topic ideas that have a high potential, while at the same time being relevant to your target audience. For this particular example we came up with: “slow roasting and cooking tips” and “best garlic mashed potatoes recipes”. Apart from the fact that your content needs to be creative and provide a great experience to readers, it also needs to have good technical SEO optimization to improve your website’s optimization. When you look at the top of the dashboard in Google Trends, you will see the Explore button. If you use keywords that are searched for more often, you will increase the chances of your content being discovered. Simply optimize your content for the most searched for keywords and make sure that they are relevant to that piece of content. This term is probably used in regular conversations more often. People like to search for terms that they use in common language and not to look for keywords, so if your content speaks the same language as the readers you will make a greater impact. Try to use these common keywords that get searched for often and you will be able to improve your SEO. However, it’s still important to understand that the more searched for keywords are probably used by other businesses as well, and you will have to compete with them. Once you are finished looking for the right keywords, you can also scroll down to see some suggested related topics for those keywords. With this feature you will be able to find some other keywords that you’ve missed and brainstorm different ideas. You will be able to discover keywords that you didn’t consider, create fresh content based around popular topics that are on the rise, and create relevant content that offers value to readers. Creating a calendar for publishing is very important in content marketing. You need to schedule your posts and release the right piece of content at the right time in order to get the maximum effect. What’s amazing about Google Trends is that it has data that can tell you what types of posts have the greatest interest around them. For example, if you are writing about fitness, you can find out when it’s best to publish that kind of content. By relying on Google Trends, you will be able to determine the best moments to publish something with ease. This is a very useful feature that can help boost a content marketing strategy in great measure. There is a lot of work involved in researching and creating the right piece of content that brings good results, don’t throw it all away by publishing posts when there are no people around to read them. Insert your keywords in Google Trends so that you can establish your own content calendar. First of all, Google Trends allows brands to understand how they are perceived compared to their competition. With this information, you will be able to make better decisions about which areas you need to work harder on to improve your brand’s influence. You just need to input the country, period of searches, type of industry, and choose web searches to find out which brands are the most searched for ones in this industry, as simple as that. This might work better for larger brands, but smaller ones can use this feature as well by choosing only their local area. As Google Trends allows you to access real-time data of many searches, you can take advantage of big events that are related to your business in some way. During big events, searches related to that event explode and you can find keywords that are related with your content, and look to create content for them and instantly boost your content. Another very beneficial feature that Google Trends has to offer is the power to search for isolated shopping trends. With these searches, you will be able to see the data related to users’ purchasing intents for all kinds of different searches on products. For example, you can create a search where you aim to discover which products in a certain niche people are most interested in. It doesn’t matter if we are talking about beauty products, sports equipment or anything else, this feature will show you the purchase intent for different countries in a single month you choose. This is a great opportunity to learn more about your market and what customers actually want to buy online. With this data you will be able to discover where your content marketing opportunities lie and focus your efforts on the right places. Additionally, you can look to boost your similar products suggestions with items that are wanted the most and promote them with your content. Recently, Google Trends upgraded their Google News Lab and it now offers analyses of currently trending stories. 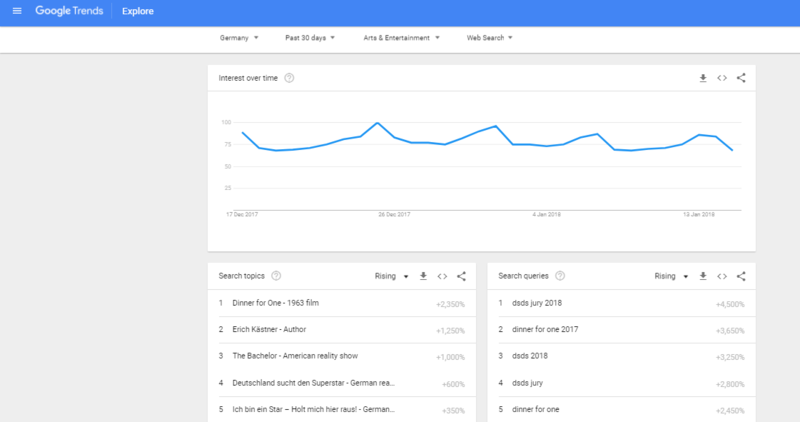 All of the information about these topics can be downloaded through Google Trends Datastore, so if you are a content creator or a journalist, this can be a very helpful tool for creating meaningful content. For example, I used this tool for the U.S. presidential election debate. I simply searched both candidates by county to find out their rankings, issues pointed out in the debate, post-debate rankings, and found interesting statistics that could benefit my content. This is how I was able to add credibility to my content and give more value to my readers. I didn’t have to wait for official polls to be released, as I had all of the fresh information I needed to provide the juice that people want. Still, you need to be careful with how you use this, and avoid making big claims or predictions that you cannot back up. Google Trends has a lot of useful features that you can use to learn valuable things about your content. What’s even better is the fact that it’s a free tool and very easy to use. Make sure to explore the things it has to offer. Have you used any other tools? What were your experiences with them? Feel free to share your thoughts. Anja Skrba is a Content Creation Manager for FirstSiteGuide an educational website which provides tutorials and guides that help people create, grow and maintain their online presence. 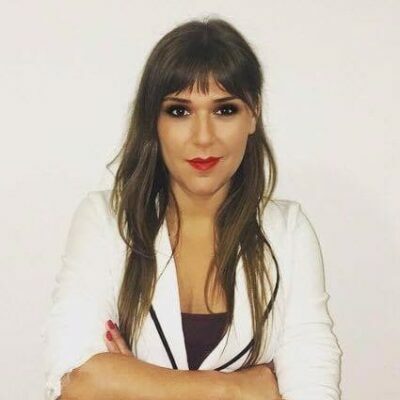 You can follow her onTwitter or LinkedIn. Thank you for this amazing article, Anja. I think google trends is very helpful.